General Ability (GA for short) is a major component in the Selective and OC tests that primary school students face in years 6 and 4 respectively. It is often misunderstood as it’s not exactly a subject that’s part of their day to day school curriculum. However when students are faced with the prospect of having to do well in the Selective or OC tests, they are confused as to what they can do to prepare for ‘General Ability’. Dux Private Tutoring can help with this! Our tutors are deeply familiar with the requirements of this component, and how to best prepare for it. We have the experience and the materials needed to help a student excel in this area in preparation for their exams. The selective test is done in year 6 and determines year 7 entry into Selective Schools across NSW. 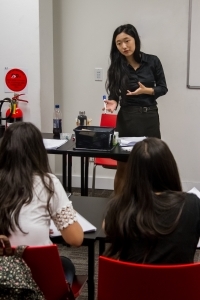 Such schools produce the strongest academic performance across NSW in the HSC, and its high achieving graduates go on to enter competitive university courses such as Law, Medicine and Commerce. Success in this early stage of a child’s schooling can be the beginning of a long term habit of strong work ethic and continued academic success. The Selective Test consists of Reading, Mathematics, and General Ability multiple choice sections. Our tutors are deeply familiar with the GA requirements for Selective Test preparation and we can devise a tutoring program to suit students of all academic backgrounds. The OC test is done in year 4, and determines entry into local primary schools that run special Opportunity Classes. Students in OC classes for years 5 and 6 often go on to be successful at the Selective Test in year 6, gaining entry into competitive schools like Sydney High, North Sydney High, Baulkham Hills, James Ruse to name a few. The test consists of multiple choice sections in Reading, Mathematics and General Ability. Our tutors are deeply familiar with the requirements for success at this stage. We can devise a program to suit students of all academic backgrounds, geared towards success at the OC test.